After months of cold weather, many of us welcome the arrival of the summer season with great relief. For the homeowner, summer brings with it a long list of chores like cleaning out the garage, power washing the deck or patio, yard clean up, and gardening. Perhaps it’s because you don’t see the roof as much as you might notice other areas around your home, but a roof inspection and maintenance tends to fall by the wayside for many homeowners even though it’s probably one of the more important matters that require tending. Inspecting and making necessary repairs to your roof may not be at the top of the list for spring chores, but taking inventory of the condition of your roof is a must after months of harsh winter weather. Because major roof repairs and especially replacing a roof can be costly, this is truly an instance where an ounce of prevention equals a pound of cure. Start by taking a walk around your home and checking out your gutters. Make sure they are securely fastened to the eaves and to one another. Replace any damaged lengths as poor drainage can lead to pooling around your foundation, which can be disastrous. We do not recommend that you climb up on your roof due to safety precautions. 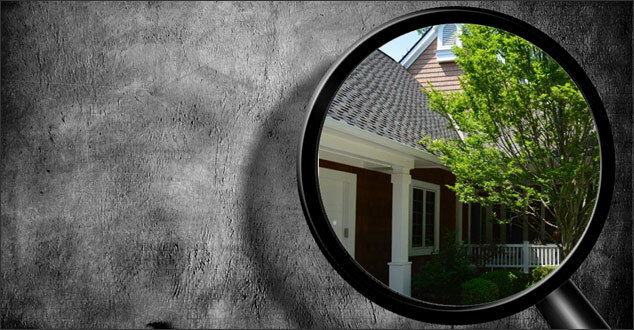 However, you can visually inspect your roof from the ground using a pair of binoculars. While walking around your home, look for any loose, missing, or curling shingles. Make sure the roofline is straight and not sagging. 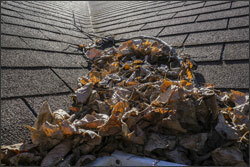 In addition, check for debris that may have accumulated along the valleys of the roof. These pockets of debris can quickly cause mold and moss to develop so it is important to address them properly. 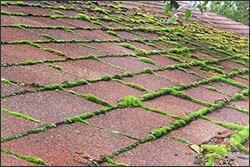 You may notice moss or algae present on some or many of your shingles. Do not power wash a roof! The strong stream of water from the power washer can wash the grit right off of the shingles and leave them vulnerable to sun damage, which can in turn cause them to become brittle and crack. If there is moss or algae present on your shingles, call a professional to address the problem and properly remove moss from the roof. This will ensure that the shingles are not damaged during the removal process. Spring is also a good time to clean the gutters or to have a professional out to do it if you are unable to do it yourself. Lastly, it is important to examine the soffits and fascia vents to keep small animals from nesting within. They can be an attractive shelter for birds, squirrels, and other critters during the cold winter months. Proper roof inspection and maintenance can significantly extend the life of your roof, saving you time and money. If you suspect that your roof needs attention, call the experienced professionals at Renovations Roofing & Remodeling, Inc. Contact us to thoroughly inspect your roof and make necessary repairs. We’re here to help.